While some only see this as a luxury honeymoon location, staying on the local island is altogether a different experience and one that is more affordable and perhaps cultural. I stayed at Mirian Sky and through them, got to try all these incredible adventures that I’ll always remember. We highly recommend Kiwi for finding the best possible flights to the Maldives. Compare the different routes and prices on their site. Yes, you do need a visa to visit! iVisa makes it super easy to figure it all out. Since these are all the best adventures in the Maldives, you’ll want to get travel insurance just in case something goes wrong. We LOVE World Nomads, and it’s the most recommended company around. For even more tours in the Maldives, we use Viator. Check here for all their available activities. Given the romantic setting as well as the beautiful sceneries, it would be a shame if you don’t enjoy a sunset beach dinner. A surprise by our lovely host at Mirian Sky Hotel, the eight guests were treated to a sunset dinner at the bikini beach of Gaafaru. With the sun setting behind us, I shared one of the most romantic moments in my life with two German sisters and our lovely host. 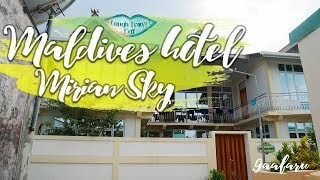 I spent a week at Mirian Sky Hotel in the Maldives. A three and a half hour ferry from the capital Male or an hour on a speed boat, Gaafaru is a small, unspoiled fishing village with a population of just over one thousand. Everyone at Mirian Sky is friendly and did their best to take care of me and make sure my stay was great, as they do with all the other guests!